#029 Bible Facts About Heaven | That's In The Bible? What does the Bible say about Heaven? Where is it located? What is it like? What is in Heaven? We know it’s not about the old image of just sitting around on a cloud with a harp all day, so follow along with us as we look at Bible facts about Heaven! 2) Heaven is up: [Psalm 139:8] “If I ascend up into heaven, thou art there…” see also [proverbs 30:4], [Mark 16:19], [Luke 24:51], [Acts 1:1-2], [Acts 1:11] etc..
[Psalm 75:6-7] “For promotion cometh neither from the east, nor from the west, nor from the south. But God is the judge: he putteth down one, and setteth up another” So God is where the promotion comes from and the only location that is left is north. God has now revealed to us what He has prepared for the saved in the Bible [1Corinthians 2:9-10] “But as it is written, eye hath now seen, nor ear heard, neither have entered into the heart of man, the things which God hath prepared for them that love Him. But God hath revealed them unto us by His Spirit; for the Spirit searcheth all things, yea, the deep things of God. Heaven is said to be immeasurable. [Jeremiah 31:37] “Thus saith the Lord; If heaven above can be measured, and the foundations of the earth searched out beneath, I will also cast off all the seed of Israel for all they have done, saith the Lord.” According to [Romans 11:1-2] God hath not cast away His people, which means “Heaven above” cannot be measured. But the new Jerusalem can be measured. [Revelation 21:16] tells us that new Jerusalem is 12000 furlongs on each side. Eight furlongs equals a mile. So new Jerusalem is 1500 miles long and 1500 miles wide and 1500 miles high. Now if you only add up the length and the width, its about 40,144,896,000 square feet. Now if you add the height into the equation, it then adds up to 500 quintillion cubic feet (a quintillion is one with 18 zeros after it). So if you allow 8 billion christians to live in the city (most likely there have not been that many christians in the last two thousand years) each person could have a house of 100,000 cubic feet. NOW THAT IS A MANSION! Do you know for sure you’re going to heaven? Heaven is a place of absolute holiness, no sin is present anywhere in heaven. There is no violence in heaven, no swearing, no taking the Lord’s name in vain, no dirty jokes, no killing, and no sinners will be present. [Psalms 24:3-4] “Who shall ascend into the hill of the Lord? Or who shall stand in his holy place? He that hath clean hands and a pure heart; who hath not lifted his soul unto vanity, nor sworn deceitfully.” So then the question arises, how can anyone get to Heaven since none of us have a “pure heart” according to [Jeremiah 17:9]? None can go to heaven because of our sins; we have all fallen short of heaven. [Romans 3:23] But according to [2 Corinthians 5:21], if we receive Jesus Christ as our Saviour, He will place all our sins on His cross; past, present and future sins, and give us God’s righteousness. And according to [Romans 5:8-9], we are justified, which means He looks at us just as if we had never sinned. So what that means is that we still commit those sins, but we are never called a liar, or an adulterer, and so on. [1 Corinthians 6:10-11] So the only way to heaven is by accepting Jesus Christ as your Lord and personal Saviour. His finished work on the cross is the only way, you have no righteousness of your own, accept Him today before it is too late and you lose your own soul in Hell! [Mark 8:36]. 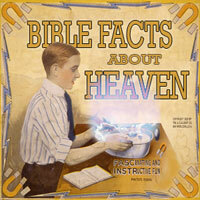 This entry was posted on March 13, 2010 at 12:44 pm and is filed under That's In The Bible - Podcast. You can follow any responses to this entry through the RSS 2.0 feed. You can leave a response, or trackback from your own site. Ohh thats me! sorry i haven’t been there the past few weeks Mr. Baer.I’ve had alot of homework thursday nights for some reason…..the devil working i presume. I’ll try to be there when i can i really enjoy it. Keep up the podcasts! Grace, mercy, and peace from God our Father and the Lord Jesus Christ. You are doing a good job on your podcasts. This comment is meant to be constructive and private (i.e. do not post). Regarding podcast #029 ‘Bible facts about Heaven’ : item (5), subpoint (3) the measurements of the new Jerusalem – the mathematical calculations are off by a factor of 10 to the 5th power. Please correct for the sake of the accuracy of your website and its witness. And they that be wise shall shine as the brightness of the firmament; and they that turn many to righteousness, as the stars for ever and ever (Daniel 12:3). Maranatha! Truly sorry you will get to go threw the goldenmost pure gates of heaven. I love Jesus and god and i love everybody in the world! Even the person who is reading this because god made you. Have a great day!